← Happy Literature Circle Day! Yes, we did it again. Third Skype in three weeks! 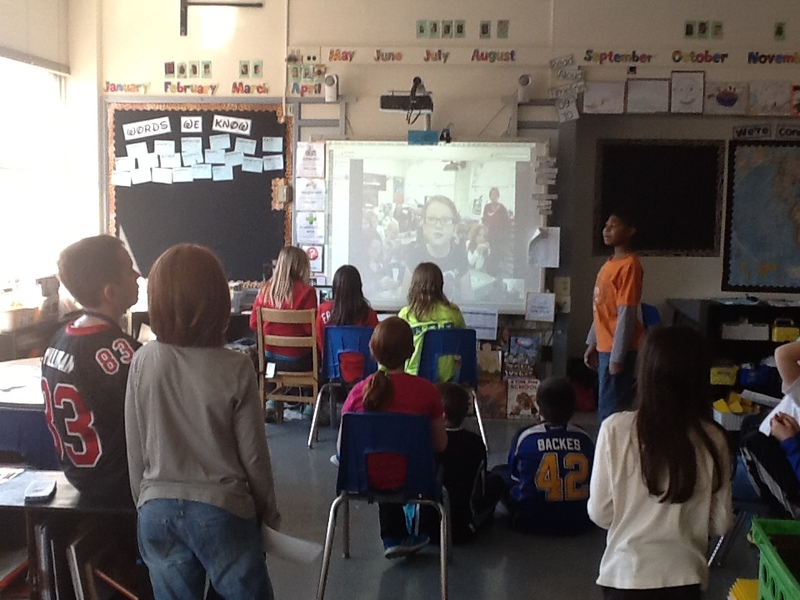 This one was a little different from the first Mystery Skype and the second one we did last week. 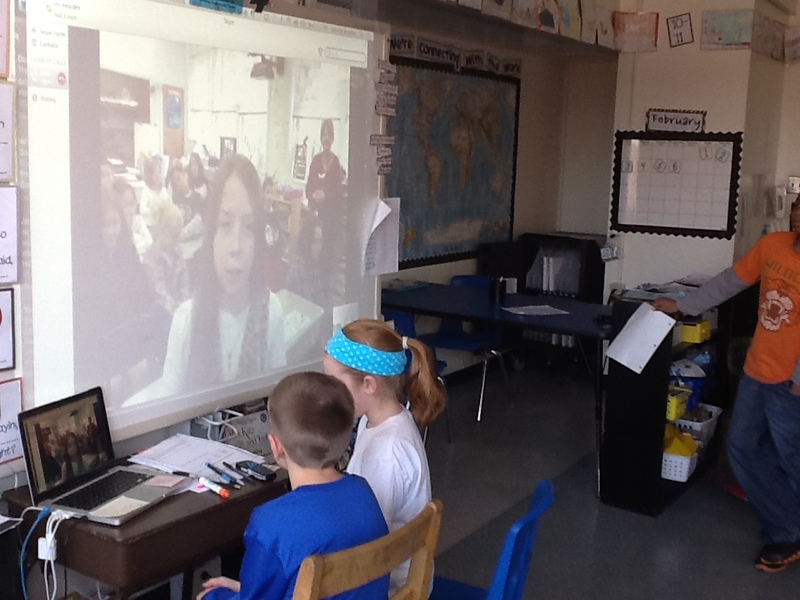 This time the location wasn’t a mystery; 4th graders from Lakehurst, NJ wanted to connect with students in the Midwest since their class was studying our region, so we just chatted. SO many thanks to Mr. Bedell (@jasontbedell) for setting it up and Ms. Lambusta for being game to try Skype for the first time with her class! The structure was similar to what we’ve done before, but since we knew that our new “friends” were going to ask us a whole slew of questions, we decided to find a way to give everyone more “screen time” during our Skype session. I paired everyone up and they had two jobs: answer a question and ask a question. We went through the first round and they asked us, then we asked them some questions. We were really interested to find out that one of the “specials” classes the 4th graders went to was Spanish. There were lots of ooohs and ahhhs when they shared that nugget; kids in our school district don’t have an option for a foreign language until middle school. We learned that Minecraft is a big deal both in NJ and MO, that they lived close to the ocean and were affected by Hurricane Sandy, and that their school is near a naval base. Pizza was a popular school lunch (as are chicken nuggets! ), and kids from both classes like to play sports games on their game systems. We had a great conversation with our new friends in New Jersey and then began thinking and talking. 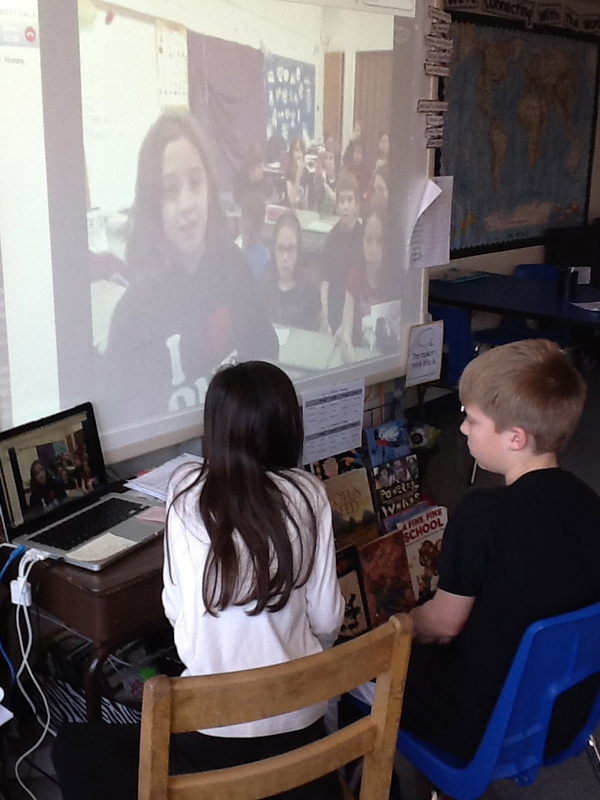 We talked about whether we liked Mystery Skype or this type of chat better. It was pretty much 50/50; many liked the “guessing” part of a Mystery Skype because it was a challenge to their brains, and many others liked the “regular” Skype because they liked the opportunity to ask and answer questions more related to them than geography. That got us thinking about other ways we could use Skype. Ames suggested that there were probably lots of other things that could be a mystery when we Skype besides location. That comment made me think of a list I read from Krissy Venosdale (@ktvee) where she shared ideas for just that! We also thought we could combine them both and first figure out the location, then get to know them better like we did this time. Both great ideas! I am so excited with how excited my students are during these types of activities. They thirst for new ideas and enjoy trying new things, especially when they involve technology. I LOVE that they trust me when I say, “Hey, I heard about this–how about we try it? !” They are game for ANYTHING! Besides being excited to try this again, we’re excited to invite other classes to join us! 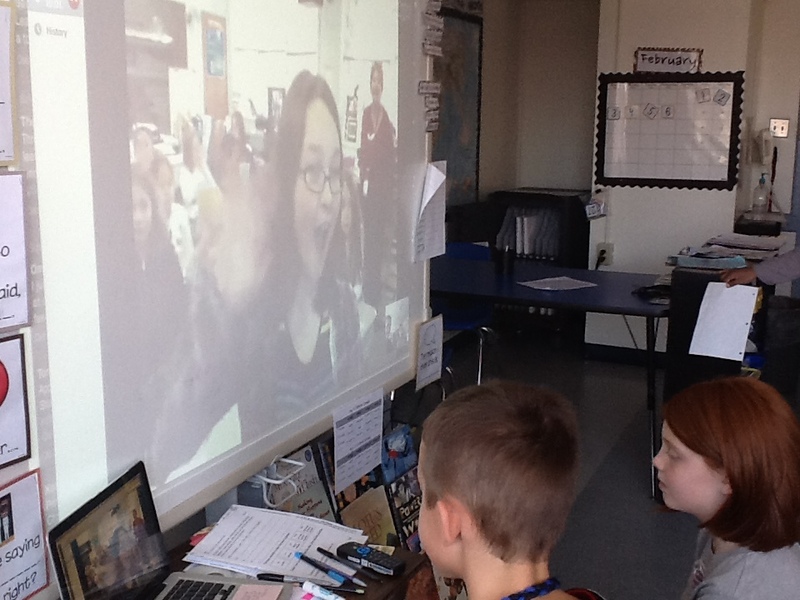 One of our 5th grade neighbors is going to sit in on our next Mystery Skype so they can learn more about it. Maybe we could even start marking our Skypes on our map of connections and try to get every state! Wouldn’t that be cool?! So…do YOU want to Skype with us? Comment here or contact me on Twitter (@jenbearden). We’d love to meet you! Posted on February 7, 2013 by Jen Bearden	• This entry was posted in Classroom, Uncategorized and tagged connections, fun, Mystery Skype, social studies. Bookmark the permalink. 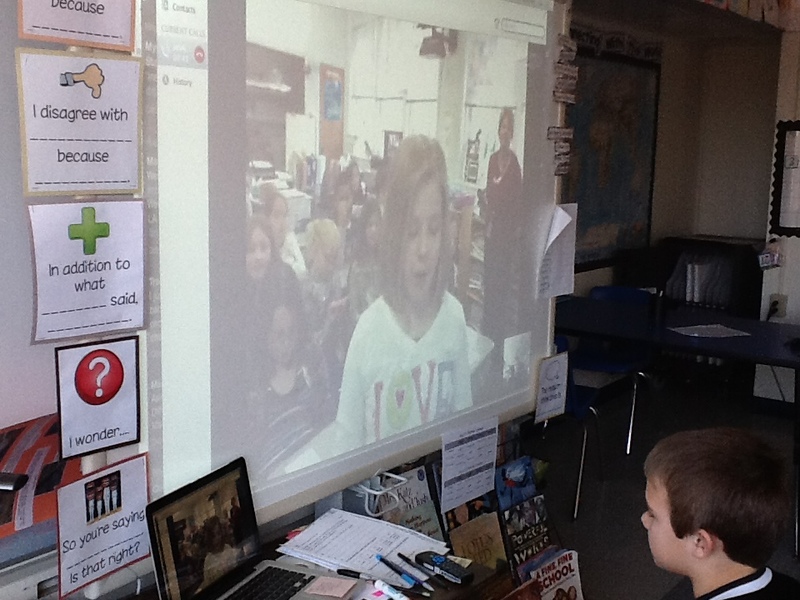 Our class would love to Skype! We are a grade 5 class overseas. Hi Jen, I team teach with another teacher here in Australia. We have 24 students in our class. This is the second year that we have run a blog. You can reach me at this email. It is linked to both of our class blogs. We live in a beautiful town near the Great Barrier Reef. Both Catherine and I have not participated in a skype session with the kids yet, but would love to learn how to do it.